So after spending quiet time in meditation with The Hermit, our Dreamer comes next to 10-The Wheel. As you can see the 10 card in RW is Wheel of Fortune and in Angel tarot, it is just The Wheel. I am not sure why “of Fortune” is tacked on to the end of the RW tarot, other than because the phrase is symbolic of luck. The Wheel card is about movement. The Wheel card reminds us of the role fate has in our lives. There are some things that we cannot control and these things are guided by luck (good or bad). Think of this as a time where free will ends. Fate is not necessarily a bad thing. It just means that there are forces beyond our control and try as we might, we cannot force things to happen. The Wheel reminds us that everything has a time and there is a time for everything. In these instances, all we can do is focus on the things we do have control over. So while there may be karmic forces going on, we still have a choice in how we respond to events and situations in life. 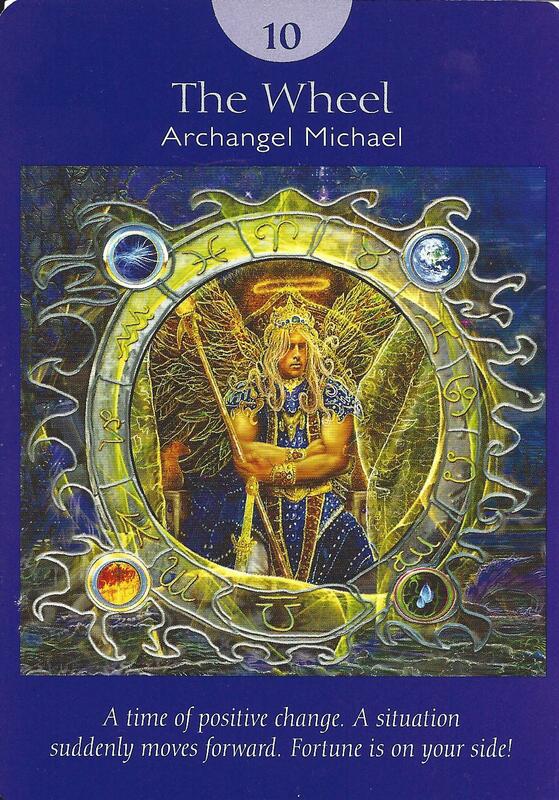 In Angel tarot, Archangel Michael is found inside the wheel. The signs on the wheel represent the zodiac and show us how everything is in continual movement. The four elements–fire, water, earth, and air–can be found on the four corners of the wheel. There is a lot of symbolism in the RW tarot. 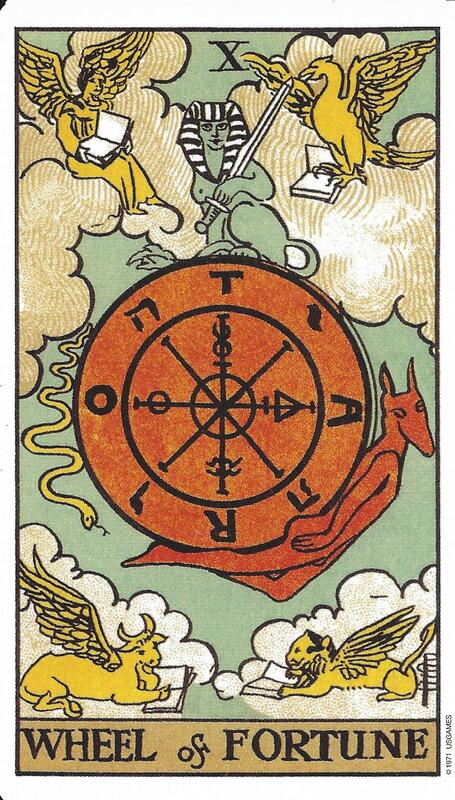 In the RW tarot, the wheel starts at the top with T and moves clockwise revealing TARO (representing Tarot). If you move counterclockwise it spells TORA (representing Torah). It can also start at the bottom beginning with R and spell out ROTA, which is indicative of the 15th-century medieval concept Rota Fortunae, the wheel of the goddess Fortuna. Rota is also Latin for a wheel. Between each of the letters, there are the Hebrew letters י-ה-ו-ה, which when translated symbolize Yahweh, the God of Israel. At the center of the wheel are the alchemical symbols for sulfur, water, air, and salt (fire, water, air, and earth). In the four corners of RW tarot are symbols representing the four evangelists–Matthew, Mark, Luke, and John–as well as the four fixed signs of the zodiac–the man (Aquarius), the eagle (Scorpio), the ox (Taurus), and the lion (Leo). They each are reading a book that symbolizes the Torah. If you draw The Wheel card you can be sure there are changes upcoming. You can expect positive changes and new opportunities. Remember is it is a major arcana card so those changes will involve the BIG events in your life. The Wheel is a card of good luck, miracles, fate, and destiny.